Caryopteris is an easy plant to propagate and well worth making more of whether you are a beginning propagator or an experienced one. The fall blooming blue flowers attract pollinators of all kinds and provide a valuable burst of color when the summer heat has blasted away most other plantings. It's deer resistant and drought tolerant with very little maintenance need. That's the best kind of plant isn't it? 2) Take cuttings with a clean, sharp pair of pruners or scissors. Look for greenwood cuttings (current year's growth) with about two nodes. Caryopteris will root internodally and sometimes I take cuttings with two leaves at the top node with no second node. 3) Strip all the leaves except for 1 to 2 at the top of the cutting. 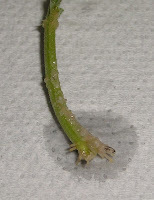 4) Coat the base of the cutting stem with rooting hormone. 5) Stick the cutting in the rooting media. 6) Water gently and keep the container moist but not soggy. A misting system could be used but I generally just monitor the cuttings and add water when needed. In a week to ten days you should see roots beginning to form. Give the cutting a gentle tug and if there is resistance odds are that you have roots - or at least your cutting does. Lift the cutting gently with a fork and plant it in a pot with soil to let it grow large enough to plant into the garden. You could try rooting directly into a pot of soil which saves you a step but I prefer to root them in sand then pot the cuttings so that I know if the cuttings have rooted or not. This works for Caryopteris clondonensis cultivars like 'Longwood Blue as well. Have you tried rooting caryopteris? I've been thinking lately about all the spring plants that will soon be rising from their beds. More specifically I've been thinking about which one's I'll be propagating during the spring season. 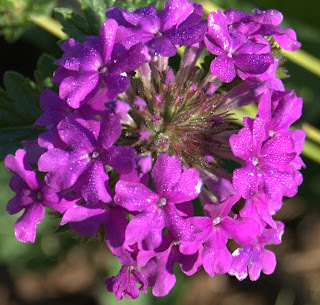 Most perennials send up new growth from the soil that is perfect for stem tip cuttings and many other plants will be primed and ready for a little division. Here's a short list of perennial plants that I'll be propagating this spring. Russian sage - mid spring stem tip cuttings and late spring stem cuttings. 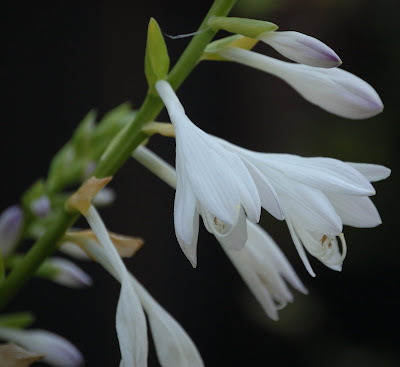 I've probably left out more than a few perennial plants from my garden for spring propagation. The list of potential plant choices for spring propagation is enormous. In my experience most perennials are best propagated in the spring when they are energized with new growth. If you are in doubt about propagating a plant give it a try and experiment - it's a great way to learn! 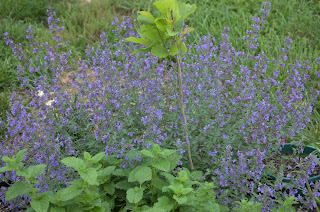 Catmint is one of my favorite perennials in the garden. It's extremely easy to take care of, looks great, and attracts a significant number of pollinators. When the leaves are crushed the plant emits a strong minty flavor that makes it nearly impossible to walk by without pulling a leaf or two to smell! It is very similar to catnip but with a stronger minty scent. How to make cuttings of catmint. Take 3-4 inch long cuttings. Remove all the leaves except for two to four at the top of the cutting. Pinch the tip to encourage branching. Dip the end in rooting hormone and place it in a rooting medium. Rooting hormone isn't necessary but will speed rooting. 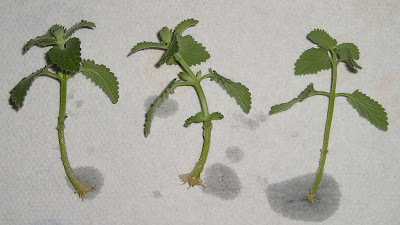 Keep the cuttings moist and monitor the cutting for a week to two weeks. 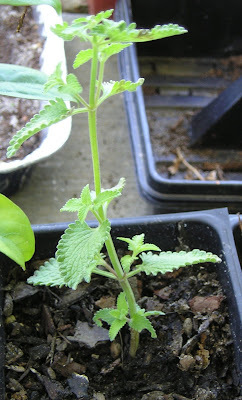 I've found some catmint cuttings will root in as little as 5 days under the right conditions. Every time a stem tip cut is made it will result in branching which encourages a bushier plant and gives you more material for future cuttings! So what is a hardwood cutting? It's a cutting taken from a mature branch of a woody plant usually during the late fall, winter, or early spring while the plant is dormant. How do you take a hardwood cuttings? With a sharp pair of clean pruners cut a mature section of your specimen with at least 3 nodes. That is a general guideline I use and it seems to work pretty well. 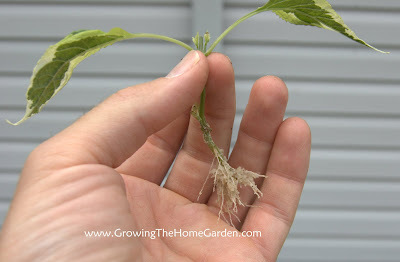 The best way to root a specific plant may vary depending upon the variety of plant so you may want to try a few kinds of cuttings out and see what works best. Hardwood cuttings should be rooted form first year growth that has hardened off. Hydrangea - these shrubs are easy rooting plants in almost any state whether hardwood, softwood or anywhere in between! Rose - my experience with roses has been limited but hardwood cuttings work as do semi-ripe. I have two in my house that need planted very soon! Viburnum - 3-4 node viburnum hardwood cuttings root very well. Place two nodes underneath the potting medium and one above the medium. Japanese Dappled Willows - OK any willow will root easily anytime (softwood, semi-ripe, hardwood) but I really like the dappled foliage on Salix integra 'Hakuro Nishiki' so I'll take an opportunity to talk about it. In the spring the foliage emerges with tints of red that gradually change as they mature into its spring through fall dappled foliage. Propagating a dappled willow couldn't be easier, just stick the hardwood cutting in the ground where you want it to grow. You can wound the bark around the base if you want to help it along a little but usually you can just stick them in the ground and they will grow. Purple Leaf Plum (Prunus) - I've had a lot of success with purple leaf plum hardwood cuttings. These are beautiful trees in the spring with their white flowers and have nice purple foliage throughout the year. In our yard these were the second to last of the trees to lose their leaves. Other members of the prunus genus may also be worth trying some hardwood cuttings. I managed one Yoshino cherry from a hardwood cutting last year. Red Twig Dogwood/Red Osier Dogwood - I love red twig dogwoods! I'll be taking some more cuttings from several of our red twig dogwoods very soon. They look fantastic planted enmass or with an evergreen backdrop. I have two varieties of redtwig dogwood that I'll treat the same way - stick them in dirt! (Cornus alba and Cornus sericea) A little rooting hormone won't hurt but isn't needed. Forsythia - Perhaps the easiest plant to propagate! Or at least a close second to willows (see above). Just stick the hardwood cuttings in soil and let them root. Softwood and semi-ripe cuttings do well also. Honeysuckle - I wouldn't recommend going into the woods to take cuttings of the honeysuckles growing in the wild. Most of these are invasive and really don't need out help to multiply but where I would recommend propagating honeysuckle is on the native Coral Honeysuckles or Lonicera sempervirens. Native honeysuckle is usually a red hue and isn't very fragrant but is still very popular among the hummingbirds. It's also not aggressive which is why it is being overtaken in the wild buy non-native varieties. Russian Sage - While technically a perennial Russian sage will propagate easily from hardwood cuttings. A few weeks before spring weather (I did this in February of last year) prune off a few branches and either stick them in the soil where you want them or treat them with rooting hormone and put them in a pot in a sheltered location. Spirea - This fun shrub is another easy one to propagate. Since the nodes are fairly close together I tend to take cuttings about 5-6 inches long rather than just 3 nodes. Butterfly Bush - Butterfly bushes root very easily from cuttings. Softwood will work too but hardwood cuttings require less maintenance! There are all kinds of plants that will root easily through hardwood cuttings. If a plant you are interested in taking hardwood cuttings from does not appear on the list above just do what I do...experiment! Plant propagation is to be my favorite subject as you can tell! Plant propagation is one of the most inexpensive ways to make more plants and expand your gardens. There are several methods of propagating plants and three of the most common ways are through through division, through layering, and through cuttings. Each of these methods has a few advantages that are worth looking at. Some of these methods will work for some plants but may not be effective for others. Here is a short summary of these methods. Dividing plants is a very good method of propagation for many clump forming species of plants. Hostas, heucheras, daylilies, ornamental grasses, and many other perennials will not only tolerate but sometimes need to be divided. It is better to divide most plants in the spring when they are actively growing and the roots can take some abuse but some will successfully divide in the fall. You don't have to divide plants until they have developed a dead hole toward the center, but if you would like more plants faster, divide away! Layering is a safe strategy for many plants. It involves burying a length of a low growing stem underneath the soil until it develops roots. Then the gardener can sever the new plant from the mother plant and plant somewhere else in the garden. To speed up the process the stem can be wounded and applied with rooting hormone but many plants naturally layer by themselves. Viburnums, forsythias, and azaleas are good candidates for layering along with many other shrubs. 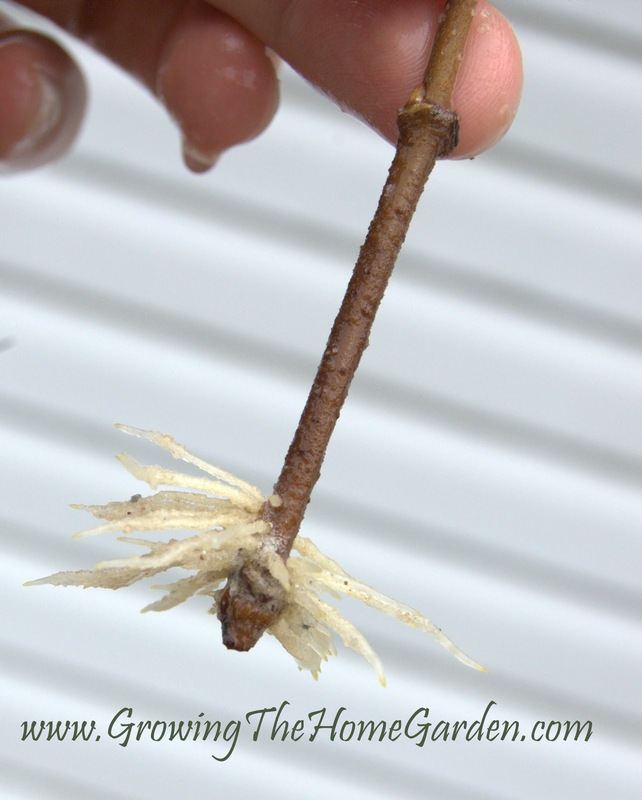 This is a safe method of propagation since the stem remains attached to the main plant until roots are formed. There is very little risk involved for the cuttings. The biggest disadvantage is that you can't make as many plants as you can with cuttings. This is probably the area I have the most fun experimenting with in my garden. There are several different types of cuttings you can take from stem tips to basal root cuttings. Some plants take to cuttings readily while others can be a difficult challenge. Most perennials will easily work with stem tip cuttings or basal stem cuttings. Trees and shrubs can be more difficult, but if the plant creates suckers there may be good rooting material. My favorite shrub for propagating through cuttings is the red twig dogwood. I've found that they work best as hardwood cuttings done over winter (although greenwood cuttings root well too) because the amount of care necessary to get them to root is minimal. Salvias, verbena, Russian sage, catmint and many other perennials work well as stem tip cuttings. Viburnums are one of the best flowering shrubs for the garden. Not only do they flower beautifully in the spring but some varieties produce loads of berries for wildlife consumption. Below is how I like to propagate 'Shasta' viburnum. How to make greenwood cuttings of the 'Shasta' Viburnum. Take 3-4 node node cuttings about 6 inches long from greenwood wood. Remove all the leaves except for one or two at the top of the cutting. Dip the end in rooting hormone and place it in a rooting medium (I use sand quite a bit). Then put the cuttings in a makeshift propagation chamber. (It was made form two reused plastic containers - one to hold the sand and the other as a lid.) A propagation chamber may not be necessary as long as the medium is kept moist - not soggy. Putting the cutting in a normal pot with a plastic bag for a cover will work fine. Monitor the cutting for adequate moisture and in about 4 weeks I had some nice rooting on the viburnum cuttings. Thank you for reading the posts here at The Home Garden: How to Propagate Plants. I began writing The Home Garden in 2007 to catalog and share my gardening experiences with other gardeners who have the same passion. Since then I've experimented with many kinds of gardening ideas but the one subject area that has always filled me with excitement was plant propagation. These pages are an offshoot of my original blog where I hope to share my plant propagation experiences with you. All of the posts here are written from my personal experiences and should work for you. I'm always looking for new plants to propagate and these postings will gradually expand as I find new material to talk about! Please feel free to ask questions in the comment sections of any post at anytime (as a stay at home dad with 3 kids my time is limited but I will try to respond as quickly as possible- sometimes in a Q&A post.) Also don't hesitate to subscribe to the feed or follow along on Facebook or Twitter! Welcome to The Home Garden! Thanks for stopping by and reading. I hope you enjoy reading about my experiences with plant propagation, vegetable gardening, and the garden projects I get myself into! If you have any questions feel free to email me or post in the comment sections of one the many posts you'll find here at The Home Garden.